In this post I’d like to focus primarily on moms who have OCD, and the difficulties they might face. I won’t be focusing on postpartum OCD, but rather on moms who have already been diagnosed with the disorder and have been living with it for a while. Some of the most common types of obsessions in OCD involve various aspects of contamination such as fear of dirt, germs, or illness. Hmm. Dirt, germs, and illness are an inevitable part of childhood. How can a mom with OCD possibly take her four-year-old child into a public restroom? Surprisingly, most can, and do. Over the years I have connected with moms who have OCD who do what they need to do, despite their fears. By caring for their children, they are actually engaging in the gold-standard psychological treatment for OCD – exposure and response prevention (ERP) therapy. And because ERP therapy works, these moms find that the more they bring their children into those restrooms, or allow them to play at the playground without trailing behind them with sanitizing wipes, or agree to let them spend time at a friend’s house, the less their OCD rears its ugly head. In short, they habituate, or get used to, being in these situations and accepting the uncertainty of what might happen. In addition, caring for a child (or perhaps multiple children, and even a family pet?) is time-consuming and never-ending, so moms are often so busy that they don’t have time to worry about all the things OCD thinks they should worry about. If your baby has a dirty diaper, the dog is barking to go out, your toddler just found the finger paints, and you need to get to the grocery store, you don’t have time to fret over your fear of contamination. You just change the diaper, tend to the dog, quickly wipe your toddler’s hands, and get out the door. OCD might be protesting in the background, but you have no time for its silly demands. Again, great ERP therapy! Of course, it doesn’t work this way for all moms, and for some, OCD is in control. Unfortunately, if obsessive-compulsive disorder remains untreated, it affects children’s well-being. Their world becomes limited, they pick up on their mom’s anxiety, and they might even mimic certain unhealthy behaviors. Moms who are struggling with OCD need to put their children’s needs before OCD’s demands. A good therapist can help them learn how to spend quality time with their children, without ruminating over all the things that might go wrong in a given moment. Modeling healthy behavior and how to deal with life’s challenges might be the best gift we ever give to our children. Finally, all of the above also goes for dads with OCD, especially if they’re the primary caretaker at home. Every child deserves the love, support, and caring only parents can provide. Parents not held hostage by OCD. I just finished reading Jon Hershfield’s latest book, Overcoming Harm OCD. It’s a valuable book that I’d highly recommend. Jon Hershfield has done it again. Overcoming Harm OCD is written with the same understanding and compassionate voice of his last book, When a Family Member Has OCD. Jon really gets it – not only what Harm OCD entails and how to best treat it, but also how having this disorder makes people feel. Through the sheer act of writing this book, he lets those with Harm OCD know they are not alone. My son suffered from Harm OCD years ago – what a positive difference this book would have made in his life! Also, Harm OCD is often misunderstood by those not familiar with it – be they therapists, teachers, other professionals, or family members. This book can educate these people, so they, in turn, can help those with this type of OCD find the right diagnosis and treatment. 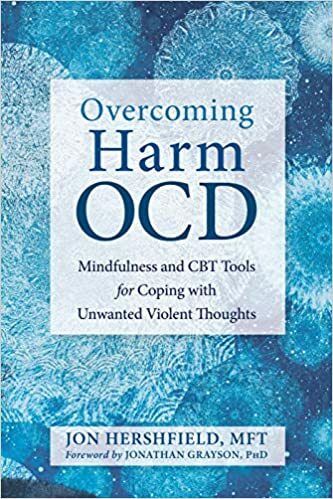 I highly recommend Overcoming Harm OCD to, well, everyone, and thank you to Jon Hershfield for all he does to help those whose lives have been affected by OCD. Doctors have recently confirmed that autism and OCD frequently occur together. Autism and OCD initially appear to have little in common, yet studies indicate that up to 84% of people with autism have some form of anxiety and as many as 17% might have OCD. Additionally, an even greater proportion of people with OCD might also have undiagnosed autism. A 2015 study in Denmark tracked the health records of almost 3.4 million people over 18 years, and researchers found that people with autism are twice as likely as those without to be diagnosed with OCD later in life. The same study found that people with OCD are four times more likely than others to later be diagnosed with autism. It can be tough to sort it all out. OCD rituals can resemble the repetitive behaviors that are common in autism, and vice versa. Also, people with either condition may have unusual responses to sensory experiences. Some autistic people find that sensory overload can readily lead to distress and anxiety, and the social problems people with autism experience may contribute to their anxiety as well. Anxiety is a huge component of OCD also, so it gets complicated. People with autism, on the other hand, often have a repertoire of repetitive behaviors to choose from. They just need to perform rituals that are soothing, not necessarily a particular behavior. More research is needed, not only in the area of diagnoses, but also treatment. The gold standard treatment for OCD is a Cognitive Behavioral Therapy (CBT) known as exposure and response prevention (ERP) therapy, but for those with both autism and OCD, it often does not work well. Whether this is due to auditory-processing difficulties, cognitive inflexibility, or something else, might vary from person to person. Researchers are trying to adapt CBT for people with autism, and agree that a personalized variation of the therapy can be beneficial. We have a long way to go in figuring out just how OCD and autism are connected. Hopefully, just knowing there is a connection, however, should help clinicians when they are diagnosing and treating their patients. When obsessive-compulsive disorder makes its appearance in a family, it often brings about fear and confusion. For one thing, OCD manifests differently in everyone. Truly, there is no end to the ways it can present itself, in addition to the stereotypical hand-washing and tidying up compulsions. A few examples include eating issues, refusal to leave the house, irrational fears of certain people, places, or things, and the inability to complete previously easy homework assignments. You name it, it just might be OCD. Which leads us to the next issue that faces parents of children with OCD – getting a proper diagnosis. Misdiagnosis is common, which of course leads to the wrong treatment. Even when OCD is properly diagnosed, the right therapy, exposure and response prevention (ERP), is often elusive. What’s a family to do? For those lucky enough to receive a proper diagnosis and referral to good treatment, you’d think the children would be on their way to recovery. However, that is not always the case – I’m hearing from more people than ever who are in this situation. While various forms of intensive treatment (intensive outpatient, partial hospitalization programs, or residential treatment centers) are often recommended for their child, many parents are concerned that a commitment to intensive treatment will disrupt their child’s life. For example, “Kate” loves dance and she’ll miss some classes and the recital, “Jake” will miss a good chunk of fourth grade if he does a particular ERP program, and “Ashley” will miss a few social events and have to tell her friends what’s going on (or lie). As an advocate for OCD awareness and proper treatment for over ten years, I cannot stress the importance of getting the right help for obsessive-compulsive disorder sooner rather than later. OCD rarely gets better on its own, and once entrenched, is harder to treat. So, for all those out there who might be in this situation, please get your child the right help as soon as possible. Friends and activities will come and go. Even missing a significant amount of time in school can be made up. But a child who grows into a young adult with untreated OCD might very well be so disabled by the disorder that he or she can’t even hold down an entry-level job. Getting good treatment now will free your child from the grips of OCD and allow him or her to go on to have a wonderful life. Dr. Seth Gillihan, coauthor of my book, Overcoming OCD: A Journey to Recovery, was recently interviewed on Talk Recovery Radio based in Vancouver. Click here to listen to the interview. Seth’s segment runs from around 5:00 – 35:00. The fear of vomiting, or emetophobia, affects people of all ages. It is often seen in childhood and if left untreated, can become debilitating. It is also known to develop during adulthood, perhaps after an associated experience such as a severe stomach illness or episode of vomiting. The consequences of vomit phobia can be extreme, leading to such things as school refusal, social isolation, and job loss. Emetophobia can also take away any joy in life, hindering travel and leisure activities, romantic relationships, and even pregnancy (afraid of morning sickness). To be clear, emetophobia is not just being afraid of throwing up. Rather it is an excessive or irrational fear about the possibility of vomiting. In fact, says Dr. Steve Seay, most of the people he treats for emetophobia have symptoms of other conditions such as social anxiety, agoraphobia or obsessive-compulsive disorder (OCD). Avoidance behaviors such as not eating certain foods (severe cases could lead to anorexia), not going to specific places, or not participating in certain events you might associate with vomiting (could be something as simple as avoiding parties with food). “Health-conscious” behaviors such as refusing to shake hands with others in case they are/were sick, excessive handwashing, and unreasonable amounts of time and attention paid to food selection, preparation and cleanliness. “Checking” behaviors to detect early signs of illness, such as being hypervigilant with your own health (taking your temperature 5 times a day), as well as being keenly aware of the health of others (watching other people eat to make sure they are not or don’t get sick). Actions done specifically to reduce the possibility of throwing up, such as the performance of rituals (If I repeat “I won’t throw up” over and over in my head, then I won’t throw up). For those with OCD who suffer with emetophobia, symptoms are also likely to include the concern that vomiting signals something much worse than it typically is, such as indication of a deadly disease. People with obsessive-compulsive disorder also might believe that if they do vomit, they will not be able to cope with the situation. Not surprisingly, those with OCD and emetophobia demonstrate more cleaning and checking rituals than others with emetophobia. While they know intellectually these rituals make no sense, they are not able to control them. As with all types of OCD, exposure and response prevention (ERP) therapy is needed to battle emetophobia. For example, a child who will only eat certain foods because she is afraid of vomiting might be asked to eat something different, and then feel the subsequent anxiety. Another exposure might include watching videos over and over of people vomiting, sitting with the anxiety and not engaging in avoidance. With more exposures (and no rituals) the person with OCD will get used to the idea of vomiting, lessening the hold of OCD and emetophobia. This is known as habituation. I think it’s safe to say that nobody enjoys vomiting. But if the fear of it is overtaking your life, please seek help. With a competent therapist, emetophobia, with or without OCD, is absolutely treatable. As many parents of children with obsessive-compulsive disorder (OCD) will tell you, getting the right diagnosis is half the battle. Getting the right treatment is the other half. It’s true that OCD can be tough to diagnose, especially in children. Rituals are an important part of a healthy childhood, and it’s often difficult to know when they should be a cause for concern. I’ve written about this issue before. Even if you and your healthcare providers recognize that your child is dealing with anxiety issues, it’s not always easy to differentiate between OCD and GAD (Generalized Anxiety Disorder). Both can be characterized by rumination, increased vigilance, and an intolerance of uncertainty. Experts in OCD and anxiety disorders should be able to distinguish between the two, but for others it can be quite difficult. To make matters even more confusing, the two disorders might occur together. A study published online in October 2018 in Depression & Anxiety aims to make it easier to properly diagnose these two disorders. The study looked at participants’ abilities in certain cognitive domains to determine if this information might be helpful in diagnosing OCD and GAD. The results were interesting. Those with OCD required more turns overall to complete multi-step problems than the other two groups, while those with GAD were more likely to make reversal errors than those with OCD or the control group. Those with GAD also took longer to identify visual patterns. Although those with OCD and those with GAD demonstrated significantly worse cognitive functioning compared with the control group, the children’s cognitive impairments and difficulties with specific skills depended on which disorder they’d been diagnosed with. Children with Generalized Anxiety Disorder struggled more with mental flexibility and visual processing, and those with obsessive-compulsive disorder displayed poorer planning abilities. The results show promise but more research is needed. One of the reasons I find this study so interesting is the fact that, as many of us know, the earlier OCD is diagnosed, the sooner it can be properly treated – before it becomes deeply entrenched. The same is true for Generalized Anxiety Disorder – the sooner the better. The more we can differentiate between these two disorders, the better chance we have for accurate, timely diagnoses.